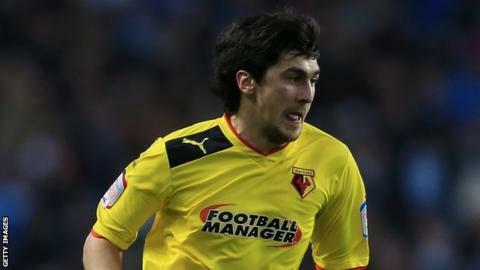 Watford have completed the signing of striker Fernando Forestieri from Udinese on a five-and-a-half-year deal. The Hornets have not confirmed the details of the transfer, but it is unlikely that a fee is involved as both clubs are owned by the Pozzo family. The Argentine-born Italian, 23, has three goals from 15 games during a loan spell at Vicarage Road this season. "I'm unbelievably happy to be signing for Watford. I will give my heart for the club," he told the club website. "I have enjoyed the town and the club so far, as well as the support of the fans. Life feels good at Watford and it feels like home. "I love working with people here and I feel protected." Meanwhile, defender Adam Thompson has returned to Watford after dislocating and fracturing his shoulder while on loan at Barnet. The 20-year-old made just one substitute appearance for the Bees.